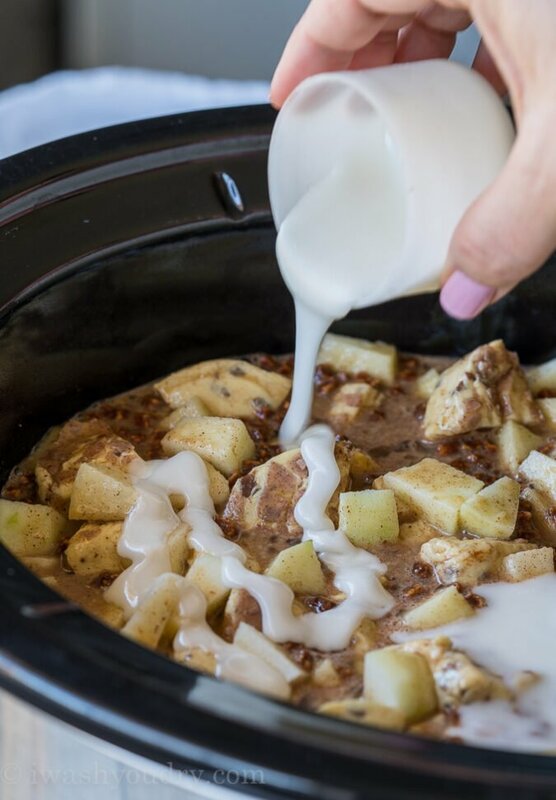 This Slow Cooker Apple Cinnamon Roll Casserole is filled with warm cinnamon rolls and tender apple bits. It’s the perfect easy breakfast for Christmas morning! I’m super excited to partner with McCormick on this warm and gooey breakfast casserole recipe! You’re going to love how easy this comforting and sweet breakfast bake is to make with it’s warm spices and delicious apple flavors! Imagine waking up to the smell of freshly baked cinnamon rolls and sweet apples. 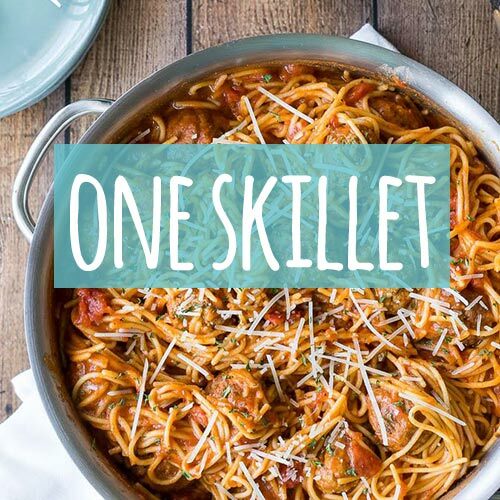 Now stop imagining, and make it a reality with this super easy recipe! 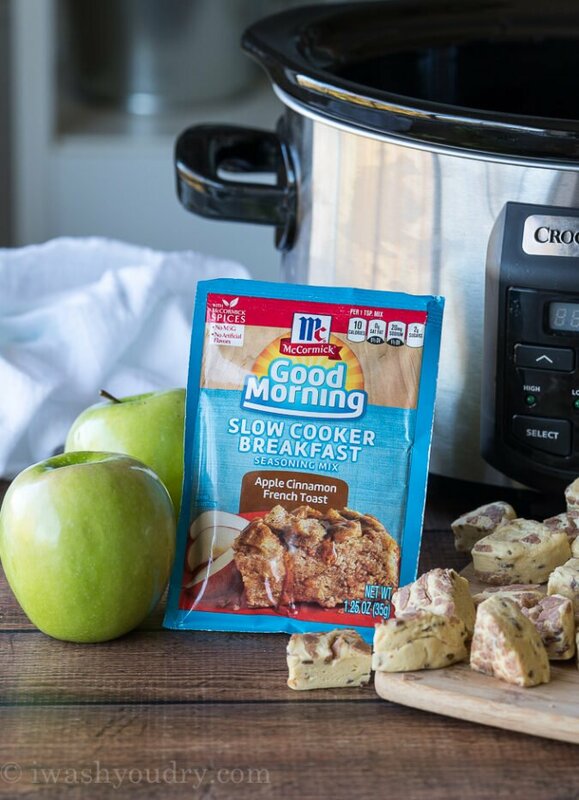 I’m obsessed with McCormick’s new Good Morning slow cooker breakfast seasoning mixes! They’ve got you covered with two sweet versions, including this Apple Cinnamon French Toast flavor and two savory versions that take your eggs to the next level. I picked this seasoning packet up at Walmart next to all the other seasoning packets (like gravy and taco seasonings). Once you open the package of seasoning you can instantly smell the brown sugar and spices! 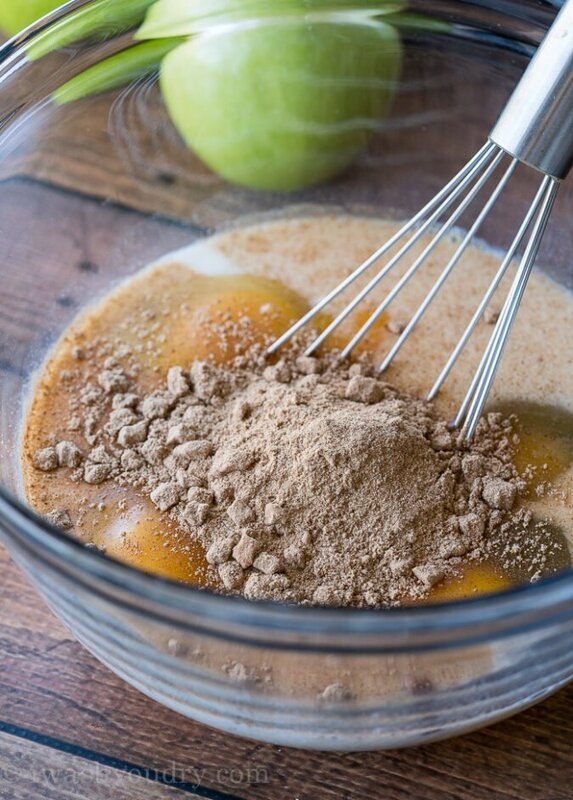 There are little bits of dehydrated apples mixed in with the spice blend which give it that delicious apple flavor. I wanted to really bring out the apples so I added a cup of diced Granny Smith Apples to my diced up cinnamon rolls before lining my slow cooker. The apples bake up perfectly tender alongside the fluffy cinnamon rolls. YUM! 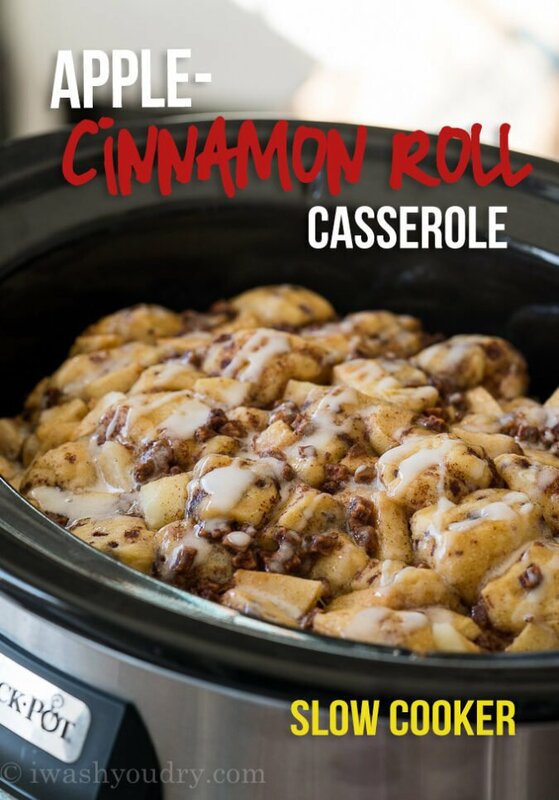 Start by layering your diced up (uncooked) cinnamon rolls and apples in the bottom of your slow cooker. Whisk together your eggs, milk, butter, maple syrup and seasoning packet until fully combined, then pour over the cinnamon rolls. Use just ONE of the icing packets to drizzle over the top of the cinnamon rolls before turning on to cook. 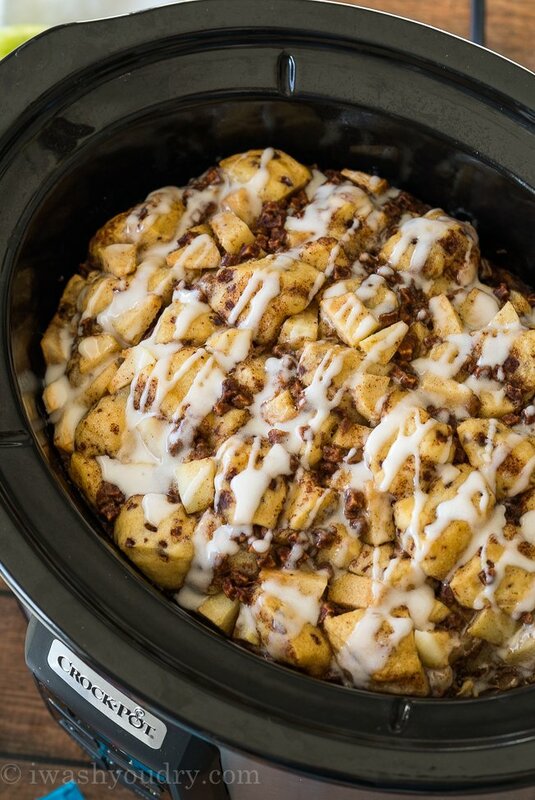 This Slow Cooker Apple Cinnamon Roll Bake only takes about 2 1/2 hours to bake, so you could pop this in your crock pot first thing in the morning and enjoy it for breakfast for brunch. 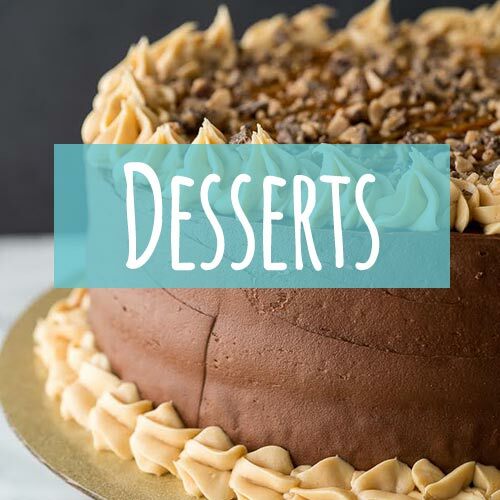 Or… if you’re like our family, this also makes a super delicious dessert! Once the cinnamon rolls are cooked through, use the remaining icing packet and drizzle over the top. I’m serious guys, this stuff is so addictive. I especially love how I didn’t have to worry about measuring all the different spices since McCormick’s spice mix covered that for me! I’m already planning on making this for Christmas morning. I’m sure we’ll be waking up before the sun (hello little children), so while the kids are brushing their teeth and making their beds, I’ll quickly throw this together. Then we’ll enjoy the morning opening gifts, sharing memories and laughs, all followed up by a delicious breakfast that my whole family loves. Yesssss…. that’s called winning at breakfast! 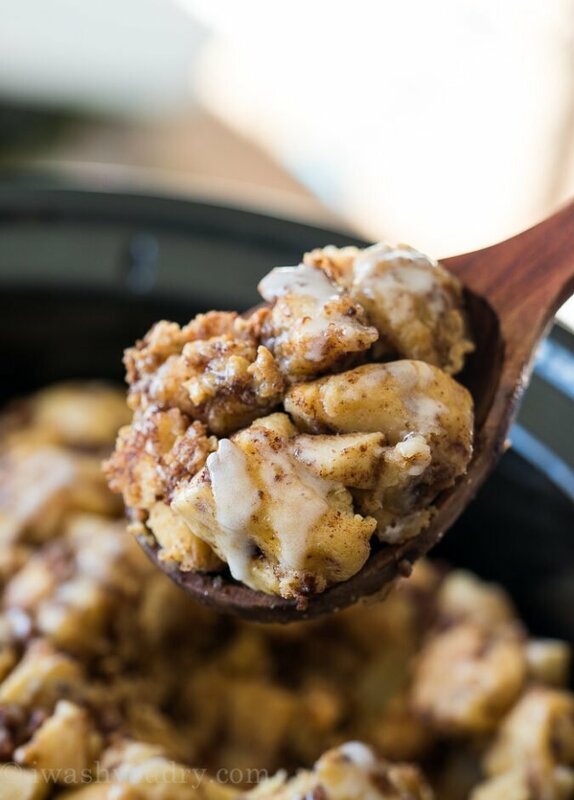 This Slow Cooker Apple Cinnamon Roll Bake is a super easy and delicious breakfast recipe that comes together in no time with flavors of brown sugar and cinnamon! Spray the bottom and sides of your slow cooker with non-stick spray. 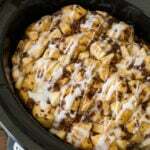 Line the bottom of the slow cooker with your cut up cinnamon rolls and apples. Set the icing packets aside. 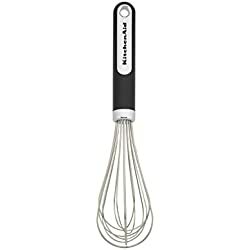 In a separate bowl whisk together the eggs, heavy cream, maple syrup, vanilla and seasoning packet until fully combined. Pour over the cinnamon rolls. 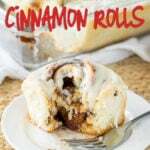 Use one of the icing packets to drizzle over the cinnamon rolls, then cover and cook on LOW for 2 to 2 1/2 hours or until the sides of the cinnamon rolls are lightly browned and the center is set. 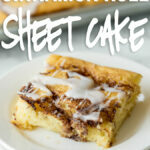 Use the remaining icing packet to drizzle over the top of the warm cinnamon rolls and serve! Enjoy! *You can find this seasoning blend in the spice aisle next to all the other seasoning packet mixes (gravy, taco seasoning, etc.). Disclosure: This post is in partnership with McCormick. All thoughts and opinions are 100% my own. Thank you for supporting the brands that help make I Wash You Dry possible. I shall try this, looks yummy! I’m so glad to hear you will try it. Enjoy! I am not a fan of maple syrup, can I use dark brown sugar, instead? Brown sugar should be fine. Enjoy! I doubled this recipe and cooked it on low for about 5 hours for our Mops breakfast this morning. The eggs mixture kinda took on a jello-ish texture among the cinnamon rolls and apples. Is that normal? What could I have done wrong? Should the cinnamon rolls have absorbed the liquid? It was still tasty! Sounds amazing, I am making it for 20 and was thinking about making 1 batch in my crockpot and 1 batch in a casserole dish and baking it. I am just not sure it will set well if doubled in my crockpot. Any suggestions? I got up early thinking this would be done in the 2-2 1/2 hours on low in my crock pot, I’m at 2 1/2 hours and still not cooked through or brown on edges. Turning up to high and hope it moves it along. My girls are hungry. 😉 merry Christmas all. I hope it cooked through in time for you! 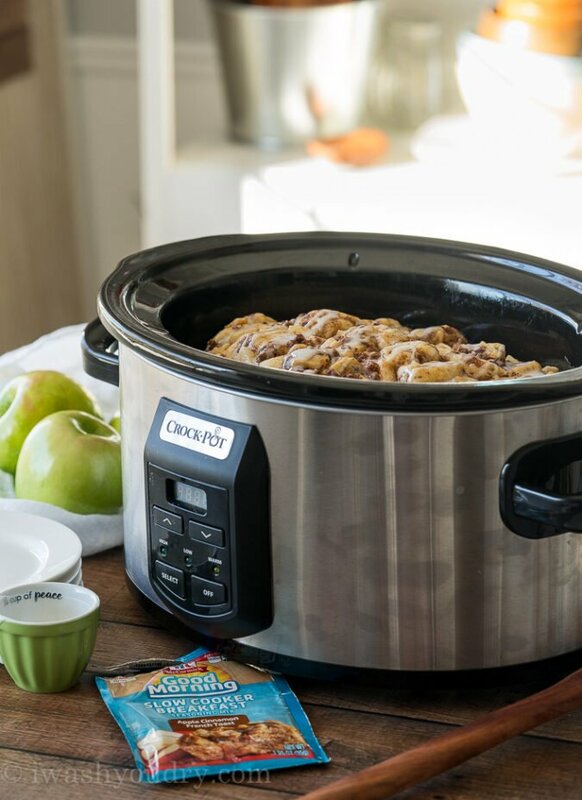 I’m thinking the shape and size of the crock pots could make a difference on how long it cooks. 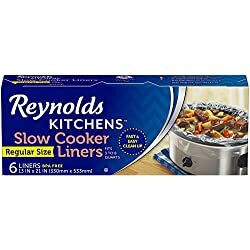 Tried this in my 6 qt Instant Pot; after 2.5 hours on low crock pot setting the rolls weren’t cooked. Increased heat to medium but still gummy. Ugh! Any suggestions? I’ve found that my Instant Pot’s crock pot setting just aren’t the same as my traditional crock pot. 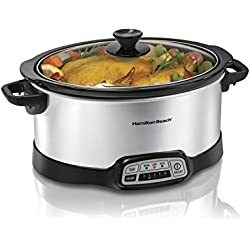 The heating element in the Instant Pot is only on the bottom, where a crock pot heats all the way around. 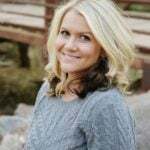 This could be why you had less than desirable results. I’m lactose intolerant …. any suggestions on how/what I could substitute for the heavy cream/half and half? I’m having trouble finding the McCormick breakfast seasoning packet. Where did y’all find it? Try looking at Walmart in the spice section near the packet seasonings like taco seasoning and gravy mixes. Oh my gosh, I didn’t know McCormick made these pouches!! They sound amazing. Can’t wait to try them. This would make the house smell so amazing! It really does make the house just smell so nice! SO darn easy! 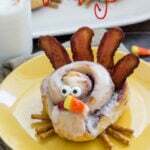 What a perfect, irreistible breakfast for the holidays! And I had no idea McCormick had all these great slow cooker breakfast seasoning mixes. Time to stock up! Way easier than making it the normal way and easier and cheaper than making nut rolls like an other blogger talked about. Easier to store leftovers in fridge too unlike storing 8 big nut rolls.Thanks for the easy recipe. I will see if Walmart carries the mixes. The spice mixes are perfect for making the breakfast a super easy one! I hope you enjoy it!